3 Bed/bath+ bonus room/pullout sleeps 8+ private yard bbq firepit mins to town. A Beautiful 2200 square foot three bed/bath home with bonus room above garage with polished concrete floors and open concept in a quiet, secluded area. On the first floor, we have a Large Kitchen with Breakfast Bar. The Kitchen is equipped with a large side-by-side fridge with an ice maker, dishwasher, glass top stove with convection oven, microwave, and all pots, pans, plates, silverware, dishes and glasses etc. needed for 8 or more to prepare great meals and enjoy family and friend time. The Kitchen is open to the large dining and living areas with 18 foot ceilings. The Breakfast bar and dining table have plenty of room to host 10. Dining area has propane stove with oak mantle. Living area is equipped with wood stove/wood supplied. Both dining and living rooms have 42 inch flat screen tv's set up with chromecast. The walk out deck leading to the hottub is reached through the deck doors between the dining and living area. The Washer and Dryer are located on the first floor along with a toilet, sink, and a cabinet filled with hot tub towels, laundry detergent, and dryer sheets. The first floor Master Bedroom has a king sized bed, an en-suite with a five foot sit down shower, large flat screen TV, and ceiling fan. Leading up from the first floor is an impressive oak stair casing with banister. Bedroom number two is located on the second floor with a King Bed and ceiling fan. The third bedroom has a Queen Bed and a Twin Bed with a ceiling fan. The bonus room has a large sectional couch, pull out couch, flat screen TV, ceiling fan, and small party piano. There are numerous books and games also available. Each room is accommodated with bedside fans and lamps, and extra blankets are provided in dressers in each room. The full bathroom on the second floor has tub shower combination, sink, and toilet. The first floor deck doors open up to a large stone patio wrapping around to the front entry. 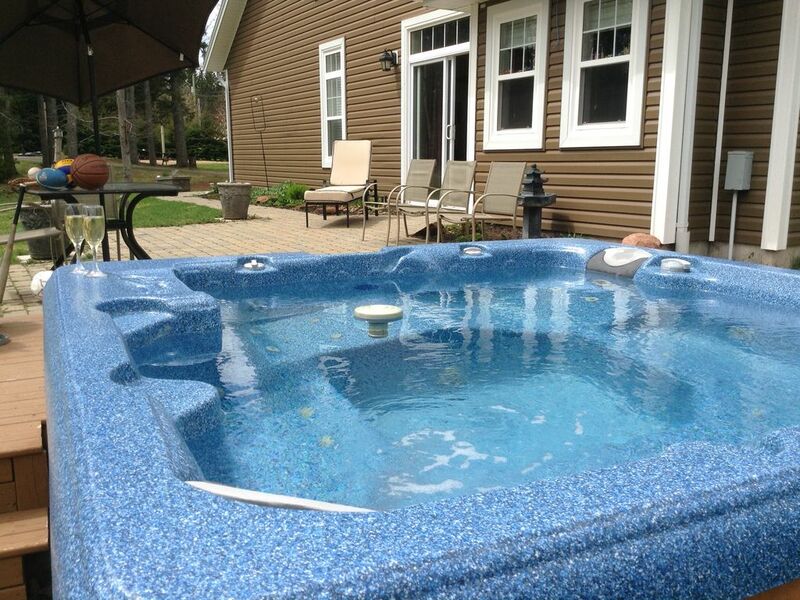 The main deck has a large hot tub with lots of flowers on the property. The back deck area is equipped with a large stainless steel barbeque. Private Beach volleyball court on property as well as a basketball net. - Country Clover Farm Store and Gas bar within walking distance. Lots of fresh meat to barbeque including homemade sausages. We are 100% Island bred and born. My husband and I have a grown son and daughter, and we now spend our summers in our small cottage, inherited by family. My husband hand picked this lot; he saw the amazing potential it had for a wonderful, hidden, family home. We designed and built this very home and tailored it to the lot. We love our home and the privacy it offers us year round. Being surrounded by trees gives the feeling of privacy and relaxation, all the while we are only 12-15 minutes to Charlottetown. It is hard to believe we have neighbours all in front of us, because when we sit in the hot tub and listen to the birds chirp, it feels like we are in our very own private getaway. On main level. Detergent provided. On main level. Dryer sheets provided. High speed throughout the house with wifi. Bath towels, hand towels, face cloths, hot tub/beach towels. Ultra quiet Bosch, new this season. Espresso with frother with bean grinder, beans provided, percolator with coffee provided, Hamilton Beach FlexBrew, and French press. There is a pantry in the kitchen. full settings for 8+, all new china and silverware, extra setting for more than 8. Living area, dining/kitchen area, master bedroom, and bonus room. Satellite tv, internet with chrome cast throughout, and sound bars. High speed internet with wifi throughout the house. Through chromecast, both living and dining area tvs have soundbars. 2 lovely courses within minutes. Many other locations within driving distance. Private in yard for 6+ people. miles and miles of hiking trails within minutes. Several play parks for children.